2018 Maple Weekends Start Making Plans! You are here: Home / Events of Interest / 2018 Maple Weekends Start Making Plans! 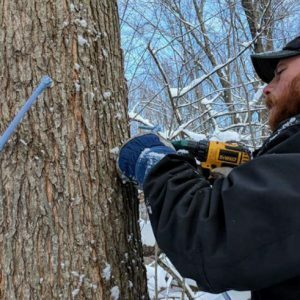 The New York State Maple Producers Association invites families from across the Empire State and neighboring areas to learn all about the production of maple syrup and other related products. Our goal during Maple Weekend is to share the taste of real mouth-watering maple syrup with you. Maple producers will demonstrate how to make syrup — whether it’s simply boiling the sap over an open fire or running it through highly scientific equipment — the results always taste great! Maple Syrup is classified according to its color. The darker the syrup, the more enhanced the maple flavor. High quality, Grade A syrup can only be made by the evaporation of pure maple sap and, in New York state, it must contain no less than 66% sugar content. The weather is the most important factor in the final maple syrup product. Maple season (also referred to as “sugar season”) generally lasts about 4-6 weeks. March is the prime month for maple production. It takes 30-50 gallons of sap to produce 1 gallon of maple syrup. Come out and learn more about the production of maple syrup at Shadow Hill Farms’ Open House on March 3 & 4, March 10 & 11, March 17 & 18 and March 24 & 25. Take a tour of the Sugar House and Sugar Bush, learn how maple syrup is made. Enjoy some free samples of maple syrup, maple cream, maple candy and maple cotton candy. Maple Syrup Pancake Breakfast will be served during the Open House”. Try our bourbon-aged maple syrup & fresh made donuts. Enjoy nearly a mile of hiking trails through the Sugar Bush, and our 3-acre pond with running waterfalls! Free tours and fun for all ages. All-you-can-eat pancake breakfast. Horse-drawn and tractor wagon rides. Tour of the sugar shack. Petting zoo. Birds eye view of the sugar bush. Maple products and baked goods for sale. Free samples of syrup and other delicious maple products. Breakfasts are served next door at our neighbor, the Log Cabin Restaurant.